Product #60637 | SKU WLC-T04-M | 0.0 (no ratings yet) Thanks for your rating! 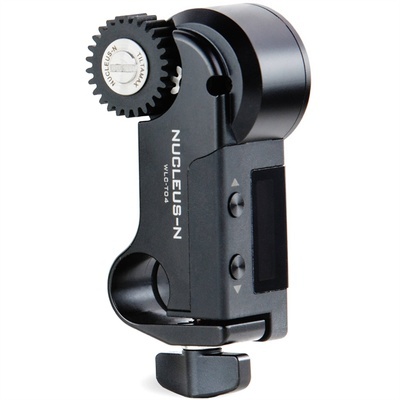 The Nucleus-Nano is a revolutionary wireless lens control system specifically designed for handheld gimbal systems. It makes it possible for a single operator to control a lens gear while simultaneously operating their gimbal. The Nano system is compatible with all DSLR, mirrorless, and modified “cine-style” vintage photo lenses! The Nucleus-Nano uses a brand new state of the art power-efficient miniature motor. The Tilta Nucleus-Nano Wireless Lens Control Motor features low noise and high torque. It can perform super fast focus pulls with silent precision! The built-in 15mm rod adapter allows for flexibility and compatibility with a wide range of camera rigs and professional mounting solutions. The motor has a 5-18V input tolerance for power via a Micro USB port. This allows the motor’s power to be drawn from the G2X tilt motor’s 5V Micro USB output or via a P-tap to 5V Micro USB cable. The Nano Motor has its own built-in motor drive that communicates directly with the Nano Hand Wheel Controller. This negates the need to mount a separate MDR to your rig, allowing for a more compact camera setup and a quicker setup time. Simply set the Nano Motor and Nano Hand Wheel Controller to the same channel and you will have full control. The wireless range of both the Nano Hand Wheel Controller and Nano Motor is 91.4m! Lastly, the Nano system can provide record Run/Stop functionality for numerous camera systems through several different cables we offer for the system.